Four students find themselves trapped in a haunted high school on the anniversary of a tragic death during a school play. Beatrice, Nebraska Police Department case no. BP-2013-1114 - October 28, 2013 – As an assignment for Mr. Schwendiman’s drama class, football player Ryan Shoos records former teammate Reese Houser rehearsing for an anniversary revival production of “The Gallows” with classmate Pfeifer Ross, on whom Reese has a crush. Ryan later interviews an older woman watching a rehearsal from the audience. She and several others recall the tragedy from 1993 and claim that the auditorium is now haunted. Discovering a broken exterior door, Ryan concocts a plan to sneak into the school at night and sabotage the set. Ryan convinces Reese to participate by telling him that he will save himself the embarrassment of having to perform, as well as turn Pfeifer to Reese for consolation. Ryan’s cheerleader girlfriend Cassidy Spilker insists on coming along. The trio enters the school, partially dismantles the hangman set, and trashes the stage. Pfeifer catches the three of them, claiming to have come inside the school after seeing their car in the parking lot. Reese tries explaining that he was only there to rehearse. The quartet discovers that all of the doors are mysteriously locked and they are trapped inside the school. Cassidy angrily admits that she and the boys were only there to trash the stage, angering Pfeifer. The group returns to the stage to discover the gallows set mysteriously rebuilt with the noose tied tightly to its overhead beam. Ryan, Cassidy, Reese, and Pfeifer explore the building. They find a television that suddenly plays a recording of a news broadcast covering the 1993 tragedy, even though there is no tape inside the VCR. Through the newscast, Ryan learns that the older woman he interviewed earlier was actually Charlie Grimille’s girlfriend. It is also revealed that Charlie was supposed to play the hangman, but was forced to take the lead role of August when the main actor called in sick. Reese sees his father Rick Houser in the news footage from 1993 and confirms from an old cast photo that his dad was the actor who called in sick. Paranormal activity occurs. Cassidy is pulled into the air by an unseen force and receives a wound on her neck. Ryan tries finding an escape route through an overhead air conditioning duct, but a force pulls him violently from the ladder as he tauntingly calls Charlie’s name. Ryan breaks his leg. Reese follows Pfeifer when she runs away in a panic. Cassidy soon follows and the auditorium door locks behind them. They hear Ryan screaming on the other side. When the door finally opens and the three of them return to the stage, they find Ryan missing. Footage from his camera shows Ryan being pulled towards the ceiling and hanged. Reese discovers his phone inexplicably locked inside locker 93. Pfeifer joins him as Reese breaks the lock to take a call from his father, only to hear ghostly static on the other end. Elsewhere, a noose creeps itself around Cassidy’s neck and she is pulled away. Reese and Pfeifer pull the fire alarm in hopes that someone will rescue them. A masked hangman supernaturally manifests and chases the couple. Reese finds a crumpled cast photo from 1993 before Ryan and Cassidy’s bodies appear hanging from nooses. The door leading outside opens. Reese exits, but is forced to reenter when he realizes Pfeifer is not with him and he can hear her choking in the auditorium. With Reese and Pfeifer both back on stage, the spotlight turns on. The couple plays their scene from “The Gallows” as Reese takes his position in the noose on the hangman’s platform. The ghostly executioner appears and Reese is hanged. Pfeifer and the hangman calmly bow to an empty room. The lights come on and reveal a solitary figure clapping in the audience. Police enter Pfeifer’s home and discover that her mother was Charlie Grimille’s girlfriend when they find both women entranced in a bedroom dedicated to Charlie. The supernatural hangman then attacks the officers. Poor Charlie Grimille. The wide-smiling student was simply supposed to play a masked executioner in a high school stage production of “The Gallows.” But when the lead actor called in sick, understudy Charlie stepped into the spotlight and onto the hangman’s platform, where a prop malfunction resulted in Charlie’s spine snapping before a horrified audience of parents and peers. It’s a colossally poor idea to use an actual neck noose and a functioning trapdoor instead of a safety harness or a breakaway cord. Teenage stagehands can be somewhat forgiven for being dimwit set carpenters, but whatever supervising drama teacher signed off on that blueprint hopefully went to prison. An even worse idea is commemorating the tragedy by staging the play’s revival on the 20th anniversary of Charlie’s awful death. That’s what happens when athlete turned amateur actor Reese takes on the same role to hopefully impress persistently perky good girl Pfeifer. Luckily for Reese, he has his former football teammate and all-around arrogant jock friend Ryan to give him grief over the career path switcheroo, with snarky cheerleader girlfriend Cassidy arm-in-arm at Ryan’s side. On some sort of assignment from current drama instructor Mr. Schwendiman, Ryan is tasked with recording rehearsals as well as behind-the-scenes B-roll seemingly out of boredom. A light bulb goes off that one way to alleviate that boredom, and be a typically dickish movie teen to boot, would be to sneak into the school and trash the stage. Ryan convinces Reese to join him, Cassidy tags along, and Pfeifer shows up too when the vandalism plan goes up in smoke and a paranormal presence locks the foursome inside for a night of terrifying torment. The opening scene of “The Gallows” is a fitting illustration of how “found footage” can evoke effective frights when its employment makes sense and a first-person feeling enhances the staging. An audience member’s camcorder captures Charlie’s hanging from enough of a slightly blurry distance that the ensuing commotion bears an authentic atmosphere of home video horror. The static wide shot of a school stage with its ominous gallows set to the right telegraphs the outcome from the outset. Even knowing full well what’s in store, the anticipation of that eventuality leads directly into a jolt when it finally pays out. That’s the funny thing about the scares in “The Gallows,” all of which are of the “quiet… quiet… boom!” variety. The framing of each “gotcha!” ghost grab is laid out in the open, obvious even to blind eyes, and the movie wants it this way. Like an animal staring into a steel trap and stepping into it anyway, the spring trips just far enough away from the expected timing to give way to goosebumps. It’s cheap and it’s contrived, but it somehow works every time, almost in spite of itself. 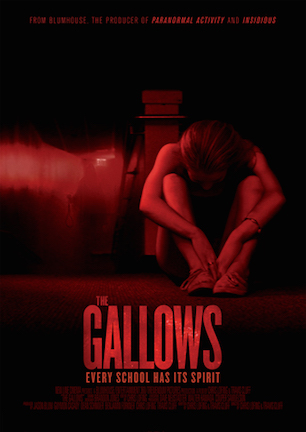 True to that technique, much of “The Gallows” is lacking in real substance. Oddly though, the movie gets by on just enough effective exploitation of simple scare tactics to make a hesitant thumb waver slightly above the middle. There are typical tropes like creepy dolls, randomly placed wheelchairs, and a static-filled television added to artificially amplify the spook factor. Yet forgivingly, about the only way I’ll accept a tube TV displaying static in the post-digital broadcast transition era is during a scene set in a public school, notorious graveyards for housing outmoded technical equipment. Similar clemency applies to the film’s cast of clichéd teenage stereotypes. They may be as rote as the predictable plot points, yet they are believably portrayed by actors who look like actual high school students and familiar friends, not 90210 headshots failing to pass for ten years younger. The usual rules of “found footage” moviegoing apply here. I.e. if you’ve already buried the format’s coffin, “The Gallows” will only engrave the tombstone. The film should probably be faulted for arriving at least ten years past its primetime window. It’s a harder argument to make that “The Gallows” doesn’t hit its intended mark of passable popcorn horror for an audience uninterested in elaborate plots or intricate artistry for a Friday night date. This is nothing more and nothing less than a by-the-book handicam spookshow. But a baseline approach doesn’t dismiss an enthusiastic cast and a smartly-staged camera combining for simple, to-the-point horror entertainment. Implausible and at times illogical, “The Gallows” is no more so of either than most films of its ilk. Running swiftly in the neighborhood of 75-ish minutes, the film never has time to truly test too much tired patience with the “found footage” formula. Forced to choose amongst any of Blumhouse’s other teen-targeted thrillers like “Ouija” (review here) or “Unfriended” (review here), “The Gallows” has marginally more to offer as a paranormal activity chiller, no matter how slight it might be in the genre’s long run. August 7, 2015 by Ian Sedensky.